Colds and the flu are respiratory illnesses that disrupt the daily productive routines of busy families each year. Counter the consequences of these illnesses with easy-to-read materials packed with tips about avoiding and treating colds, flus and more. Starting good hygiene habits early fosters healthy communities for everyone. For many people, getting a cold or the flu is an annoying experience with the added inconvenience of missing days of work or school. For other people, many illnesses such as flu can cause serious and sometimes life-threatening complications, especially in infants, young children and older adults. During flu season (typically October through March) cases of the flu can become alarmingly widespread. With thousands of people hospitalized every year due to flu-related symptoms, everyone can use a strong reminder about how to avoid seasonal illnesses and how to prevent spreading germs. 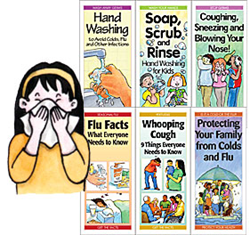 Health educators are invited by Journeyworks Publishing to review some of their timely pamphlets with messages about hand washing, vaccinations and more. In addition to information on protecting against colds and flu, Journeyworks Publishing is also offering a review copy of their recently released pamphlet on Whooping Cough. This serious bacterial infection has been on the rise lately and public health educators can benefit from the simple presentation of clear facts that Journeyworks delivers in their pamphlet on this topic. To assist health professionals and educators with the big job of increasing awareness about these contagious illnesses, Journeyworks Publishing is offering a complimentary review pack of health materials focused on preventative measures for common ailments. Not only are the materials timely, but they are easy to read, accurate and affordable. Professionals are invited to request the Cold and Flu Protection review pack, to see how these materials can bolster their prevention campaigns. Coughing, Sneezing and Blowing Your Nose! Professionals promoting health and wellness can click here to request a complimentary Cold and Flu Protection review pack today. Journeyworks Publishing is a national health education and health promotion publisher with more than 10,000,000 pamphlets, brochures, booklets, posters, bookmarks, videos, digital pamphlets and other products distributed each year. Used extensively by public health departments, hospitals, schools, VA programs and more, Journeyworks materials are known for being creative, effective, easy to read and accurate. You can learn more by visiting http://www.journeyworks.com.